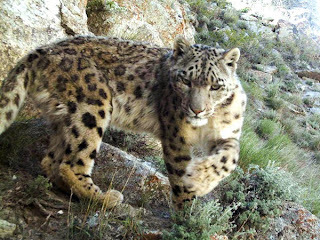 Pawperty: On the Prowl - Snow Leopard Population Thriving! A snow leopard recently photographed prowling the mountains of Afghanistan has plenty of company, as revealed by the first camera-trap pictures of the big cats in the war-torn country. The pictures, taken by a team led by the Wildlife Conservation Society, show that a surprisingly robust population of possibly a hundred animals is prowling the remote Wakhan Corridor (see map). Previous estimates have suggested that perhaps only 4,500 to 7,500 snow leopards—considered endangered by the International Union for Conservation of Nature—live throughout the mountain ranges of Central Asia. "Afghanistan has been devastated by 30 years of conflict, so you might not expect there to be a lot of large wildlife left. But there does appear to be a fairly large population of snow leopards, and that's wonderful," said Peter Zahler, who launched the Wildlife Conservation Society's Afghanistan program in 2006.